Let's face it. Although Handbrake has been updated to the latest v1.0.7, something unhappy will happen to you if you want to rip DVD on Mac Mojave with Handbrake, because this version does not keep abreast of the OS X Mojave. Frankly, there is a way out. You can seek for an alternative to Handbrake for Mac Mojave to settle the issue. What's more, for those commercial DVDs, Handbrake only works with the aid of VLC media player. But the Handbrake alternative for Mac Mojave acts as both DVD ripper software and a DVD decrypter that circumvent all kinds of copy protection schemes, no matter the normal CSS, Region Code 1-6, UOPs, RCE, or Sony ARccOS, Disney Fake, all by itself. Thus, you are allowed to copy top 2018 movies DVD or latest movie DVDs to DVD, backup Disney DVD Inside Out or Captain America: Civil War DVD easy as ABC without any third party involving. Free download this Mac Handbrake alternative on Mac macOS Mojave and launch it, hit "DVD Disc" or "DVD Path" button to import the DVD you want to rip on your Mac. Select the output format as you want. From the drop down menu, you can choose to rip DVD to MP4 format, or backup DVD with main/full title, clone DVD to ISO image on your Mac Mojave or simply rip copy protected DVD to iPhone, iPad, Android, etc. After finishing the above steps, simply click the "RUN" button to start the task of Handbrake rip DVD with this Mac Mojave DVD ripper (best Handbrake DVD ripper open source alternative). You can view the whole progress and are able to cancel it at anytime. One thing needs to be specified is that this Mac alternative to Handbrake adds 350+ profiles for the recently released mobiles. Hence, no matter you want to play DVD on iPhone XS/XR/X/8/7/7 Plus/6S/6S Plus/6/6 Plus/5S/5C, iPad Mini 4 (Retina), iPad Pro, or import DVD to Apple TV 4, iMovie, Galaxy S9/S8/S7/S7 Edge/S6 Edge+/S5/Note 9, Kindle Fire HD, etc. (350+ device profiles) , this DVD ripper Mac can fulfill your needs in a couple clicks. BTW, after ripping DVD with Handbrake alternative for Mac, you can take advantage of MacX MediaTrans to transfer the converted video content to iPhone iPad iPod for enjoying on the move. Serving as a functional iOS file management software, this iPhone file transfer also can aid you to easily copy photos to Mac/PC, move music/ringtone/eBooks between iOS devices and computer, mount iPhone iPad iPod as flah drive, etc. Seeking for DVD ripper on El Capitan to rip DVD on Mac OS X 10.11? This tutorial will demonstrate you the best DVD ripper on Mac OS X, El Capitan system, allowing you to rip DVDs to iPhone iPad etc. and providing you an flute ripping experience. 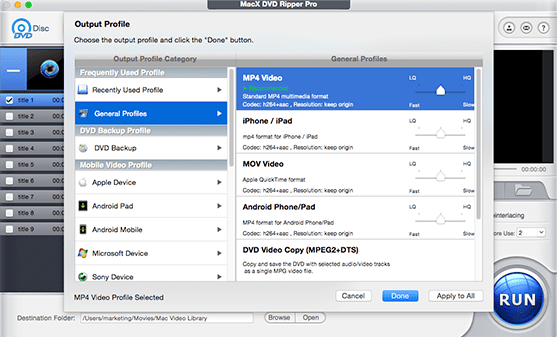 MacX DVD Ripper Pro, sought-after alternative to Handbrake for Mac to effortlessly remove any DVD copyright protections and copy DVDs to ISO image, MP4 MOV AVI FLV MKV dozens of formats with original quality reserved.